Toby (03-39) came into our lives on May 14, 2005. He was a 2-year-old full of life and adventure. We had lost our golden, Chester, to cancer in 2004. Chester was a GRRIN dog adopted in the year 2000. 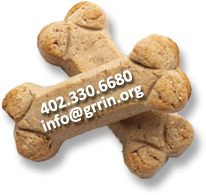 Nick & Karen had the idea that Chester was lonely so Razzy (02-32) “came home” to them from the GRRIN adoption program. Next Razzy found her new best friend in Toby. He became Toby ‘T’ because he was always in “trouble”. He was described as an “energetic and lovable dog with a mischievous side to his personality”. Toby lived up to his reputation! Luckily for all of us, he always lived in an environment where he could jump fences and run to the neighbors to get cookies. He started out living in Riverside Lakes where he learned to swim, walk in the fields and jump into the Elkhorn River for a swim. Toby spent most of his life living on an acre of waterfront property in Arkansas. He loved the trees in his yard where he and Razzy could chase the squirrels and swim whenever they wanted. Both took long walks in the forest sniffing and chasing all the little varmints they could find. They loved to dig and would come out of the woods with dirt all over them. Baths were a must for both. Toby and Razzy loved the boat rides on Lock Lomond Lake. Toby was great with children, dogs, cats and other people. Toby would greet everyone with a big, deep bark which could be scary if you didn’t know that he was just a great big ball of fur. Toby was diagnosed with malignant melanoma in 2011. Our astute vet consulted with K-state Veterinary College, where we had taken Chester for his cancer treatment, to set up a protocol for his procedures. All was going well for Toby for several months until he showed symptoms other than what he was being treated. Toby fought a valiant fight against the cancer but lost that battle May 14, 2012, his “coming home” date. Nick and Karen are so blessed to have had Chester & Toby in their lives. We now have our Razzy who is 11 years old and doing so well. She has survived her two best friends and is the sweetest “puppy”. 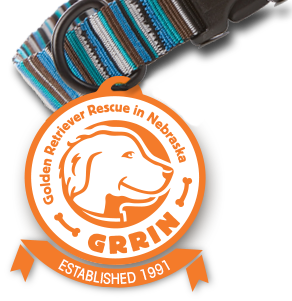 We are grateful for the memories and adventures we have had with our GRRIN dogs and are so glad we are able to make their “forever” homes just right for them. Toby you are so loved and will be missed forever. Your pictures and memory book will live on in our lives.